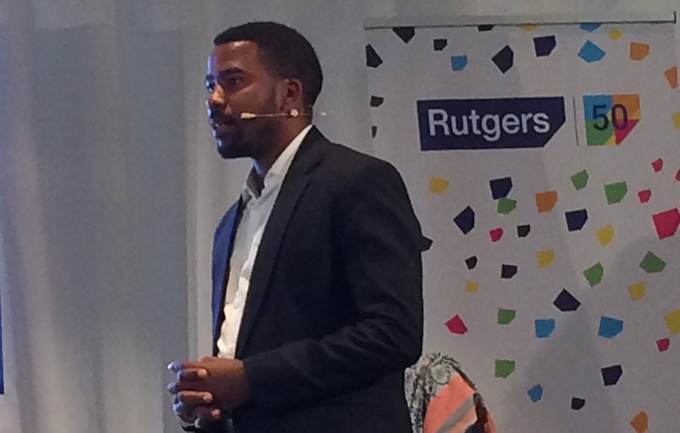 On November 2nd, our Team Leader Humphrey Nabimanya joined our partners Rutgers at the Nicolaic Church in Amsterdam, Netherlands to celebrate their 50 years of sexual development together with 300 other Sexual Reproductive Health and Rights (SRHR) advocates from across the globe. Rutgers, one of our pillar partners who have seen us grow, is a leading international centre of expertise on Sexual and Reproductive Health and Rights founded and based in the Netherlands that is supporting organizations in the that field. In Uganda, Rutgers supports 6 partners under the SRHR Alliance. At the anniversary, Humphrey talked about the country context of Uganda in respect to young people sexual reproductive health and rights, the different Reach A Hand Uganda projects supported by Rutgers for example Get Up Speak Out, Sautiplus, U-Decide and the Peer Educators Academy as well as the hope for the Ugandan youth. “I’m from a family of 26 children. I am the youngest. My sisters were married when they were sixteen or seventeen and for my brothers it was not possible to finish their school. For myself and my siblings, it was difficult and challenging to inform us about sexual health and family planning. Girls in Uganda are pregnant at a young age, sometimes at the age of ten or eleven. Sexual education is essential and that is why Reach A Hand Uganda is changing the status quo.” Humphrey was quoted saying at the anniversary. Next Story We’re looking for a video storyteller to produce a compelling human interest story!